l just bought 2 budgies on sunday . 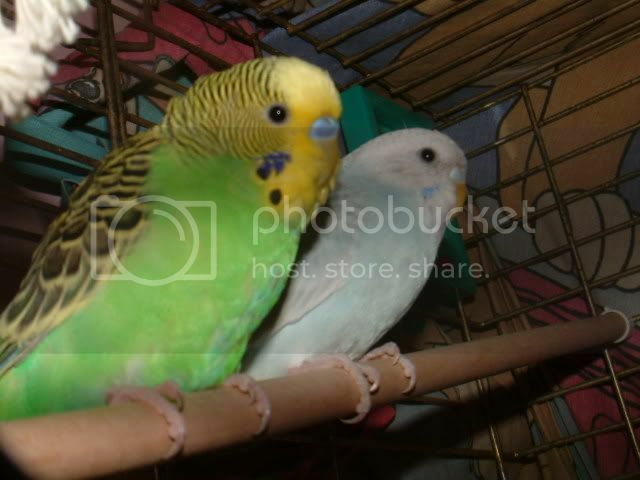 so l'm fairly new at keeping birds , they are my first birds that l have ever kept . so l'm glad l found this website , alot of good advise. the green one on the left l named Hobbes and the light blue one l named Claire. oh and l have a question , when l give my birds a bath should l do it once a day or twice ? so far l have been spraying them once a day. That's a gorgeous photo! Hobbes is male and i'm fairly sure that Claire is female. You can probably cut down the baths to a couple of times a week. Look forward to seeing you about and hearing about and seeing more pictures of Hobbes and Claire. Hi, welcome to the forums! Pretty birds you've got there! Hi! welcome, you have very pretty birds there! Welcome to the forums. Your Claire looks just like my Tweety. Can't wait to see more pictures of her. They are both very lovely! You will find lots of great information here. I got my first 2 budgies in January, and now I'm up to 8. I've learned lots!!! thank you for all your replies l feel so welcomed here , and yes l will post more pics of them soon . Hey fellow Canuck and Hobbs and Claire as well!